A regular feature of life on Thomas street are the stalls which are dotted along the road up to St. Catherine’s Church. I managed to sit down for a cup of tea with Kathleen and have a chat about trading on the street. Their day starts at 6 am. The stall is set up and running by 9 am and trading until late in the evening. The stall is then broken down and the stock loaded up and the day finishes at 9 pm. Kathleen and her son David currently trade on the corner of Merchants Quay Ward. Her family have been trading on the street for 197 years, starting with her great grandmother Mary. Then passed down to her grandmother Christina and onto her mother Kittyo. Kathleen herself started sometime in the 50’s. 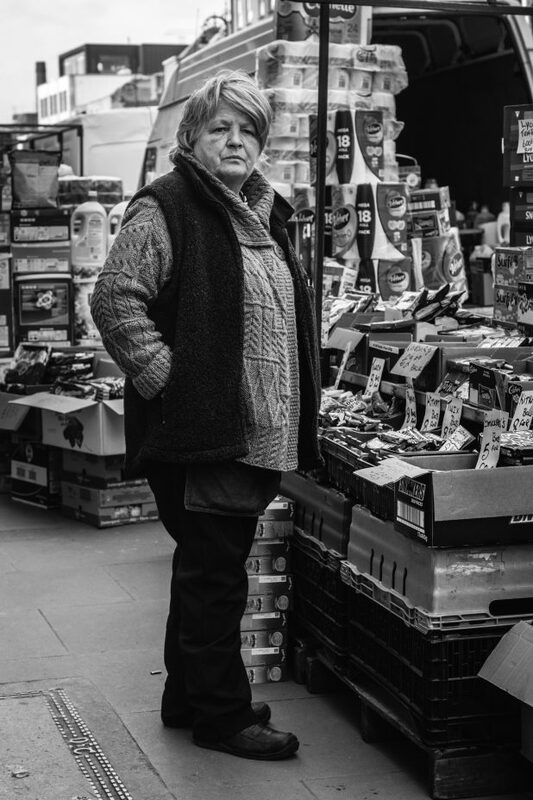 As a child she remembers having a fish box for a seat under the stall and eventually moving up to trading, selling fruit and veg, fish until the 90s, toys, Easter eggs and other sundries. At one point she had a number of stalls operating in Dublin 8, one selling flowers at St Kevin’s Hospital (now St James) and another stall outside the Tivoli Theatre selling chocolates and sweets to the cinema and bingo customers. Her grandmother was arrested in 1892/3 for selling shamrock outside the G.P.O. She had to walk from the court to Mountjoy in her bare feet where she was imprisoned for 3 days. She was also, a member of the Suffragette movement , and was present when Hanna Sheehy Skeffington smashed windows of Dublin Castle in protest against women not having the right to vote. Business has been steady but there has been a decline in the number of traders over the last few years. There was 45 families trading here in the 90’s, today there is one full time and three 1 day traders. “DCC stall cost is too high”. She adds, “They just see us as traders. But we’re vital to the community, we’re here to talk to people…to counsel them and give advice, face to face. DCC do not see this”. But she is optimistic for the future, hoping that the redevelopment of the area will bring in fresh blood and more importantly brains. In her opinion the latter is needed in order to revitalize local commerce and industry. During the 80s and 90s Kathleen did a fair bit of travelling in order to train up on what was known back then as “exotic” fruit. “I’ve traveled all over. I was in the U.S and Holland. Along with China, South Korea, Japan and Singapore”. She learned how those cultures ply their street trade. “Having healthy street trading is also vital for the Tourist trade”. “All that I’ve been sayin’ the past 30/40 years has all come true cos they didn’t listen. As the TD’s said at the time, we were peasant people. Well how peasant we are, when its us that’s gonna drive this country forward and take it back from the brink of destruction”.